Eternally appealing, there are many reasons to travel to Rhodes, largest of the Dodecanese. Broadly you could say it's sunny, sandy, beautiful, historic and delicious. Because so many folk are drawn here there's a huge range of choice when it comes to choosing the best places to stay in Rhodes. From diving resorts to campsites to traditional guesthouses to luxurious modern hotels. Rhodes Town is the capital, with a charming Old Town that's a maze of alleyways which open out to reveal restaurants, cafes, museums and chi-chi boutiques. Heritage Listed, Old Rhodes Town has a fascinating blend of architecture, influenced by Rome, the Byzantines and the Medieval order of Knights who settled here and who're responsible for much of the fortification. The New Town is where you'll find the waterfront bars, cosmopolitan beaches and the luxury shopping. Rhodes is a great place for foodies, partly owing to the island's verdant conditions and the bounty of the sea, so you'll really be spoiled for choice. Whether you choose to stay in Rhodes Town, or one of the other resort towns, or a smaller fishing hamlet, you'll find plenty to do. You've heard of the Colossus, right? Well, the 30 metre statue's no longer, but the best places to stay in Rhodes will find you near to plenty of other ancient archeological and mythological treasures which you can uncover. The waters here are crystal clear, so many visitors make their discoveries underwater, but the rolling hills of the interior hide numerous charming villages, many of which have their own little museums and churches. Wander through the historic alleyways of Rhodes Old Town. Visit the Acropolis of Lindos with its ancient temple and towers. Stroll through Butterfly valley, a place of incomparable natural beauty. Stop by the fascinating Archaeological Museum of Rhodes. Unwind on the pristine beaches. With so much to see and do the island is very popular especially during the peak summer months. If you want to guarantee a room in one of the best places to stay in Rhodes, get organised and book well ahead. The Marco Polo Mansion has the ambience of Rhodes' Old Town just right. A lovingly restored Ottoman townhouse with only seven rooms, a stay here is like staying in another time. The walled garden is peaceful and beautiful, the restaurant is good and it's all very romantic. The Rodos Park Suites in the New Town is the polar opposite - bustling, close to the beach and fresh and modern with all the mod. cons., including a large pool and poolside bar. The Zacosta Villa Hotel is a slightly old fashioned and very charming three room hotel in central Rhodes. You're close to the museums and the Knight's castle, and though there's no restaurant on site, you're surrounded by them and the breakfasts here are excellent. The Nikolis Hotel & Apartments occupies a stunning medieval castle in the centre of town. This is a great place for lovers of detail - there are wooden beamed ceilings, lovely private balconies, stone walls, fourposter beds and a rooftop garden with wonderful views over the town. Lindos Blu sits pretty on the cliffs above Lindos, with spectacular views of the turquoise bay and sugar cube village just a short stroll away. The spa is top of the range and the rooms and suites offer every modern luxury and in some cases your own private pool. Rodos Palladium is a modern five star hotel right on the beach. This hotel is for you if you're looking for a resort style beach break, but beside a fascinating town. There's a tropical lagoon style pool and gardens, a choice of restaurants and private, ocean-facing balconies. It only has six rooms, so you'll need to book early to reap the great value of the Apollo Guesthouse. The rooms are small, but really charming and well planned, the leafy courtyard is like your own private refuge from overpriced restaurants and cruise ship crowds. It's within walking distance to many of the city's major attractions. 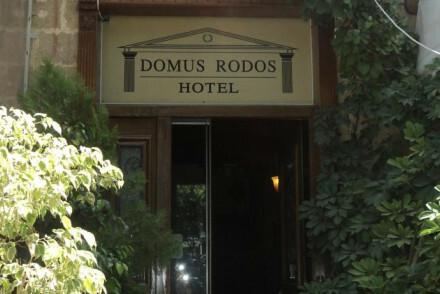 As well as being reasonably priced, Domus Rodos is a great place to stay for history buffs. This no frills townhouse pension was formerly a stronghold for the Knights of St John of Jerusalem! Only a 10minute walk to the ferry harbour, it's also one of the best places to stay in Rhodes for island-hoppers. 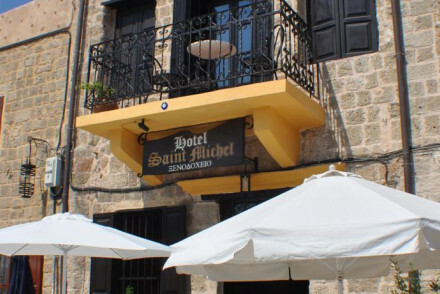 Saint Michel Hotel is a traditional hotel in Rhodes Town centre, set in an 800 year old building. Simple and homely accommodation with basic rooms and a roof terrace overlooking the city and the bay. Perfect to keep costs low while exploring the lovely Old City. 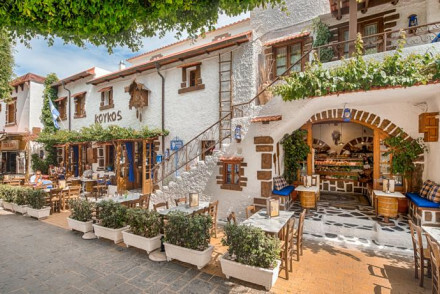 Koukos Traditional Guesthouse is a good value guesthouse combining Greek-rustic style, with quirky Alpine deco and excellent home-cooked food. 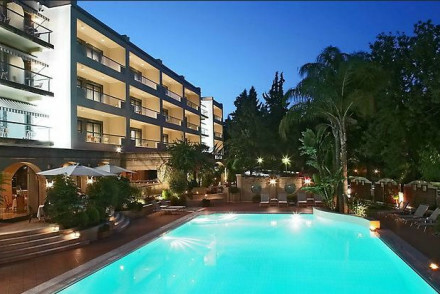 Modern and close to the beach, the Rodos Park Suites is a comfortable, modern hotel with a full sized pool and all the mod. cons.. The antithesis of 'boutique', this is a classic but comfortable hotel. 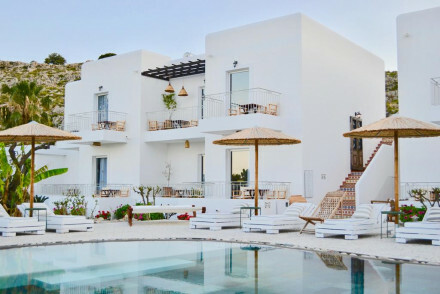 The Melenos Apartments are a lovely collection of nine suites and studio apartments in Lindos, on the east side of the island. Basic with plenty of whitewashed charm, this is a comfortable place to stay for family and groups who're watching their wallets. A chic boutique with lots of character. In Camera Art Boutique Hotel's individually decorated rooms and suites have creamy furnishings and attractive works of photography. 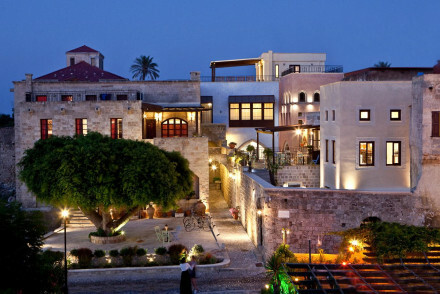 Spirit of the Knights is a gorgeous boutique hotel with all its original elements in the old town of Rhodes. Romantic rooms in traditional elegance, terraces, roof top jacuzzi, private yoga or massage. A classy and luxurious boutique refuge with spectacular views over the Aegean. 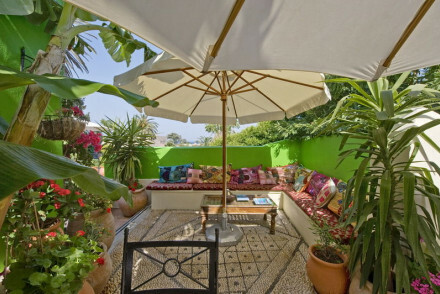 Large rooms decorated in a Moorish style with enormous raised beds and lovely sea views. Melenos Lindos' romantic rooftop restaurant is one of the best on the island. St Nikolis Hotel is a delightful family-run hotel in a charming 14th century building. Individually decorated rooms are awash with heritage and emblems of the rich history of Rhodes. 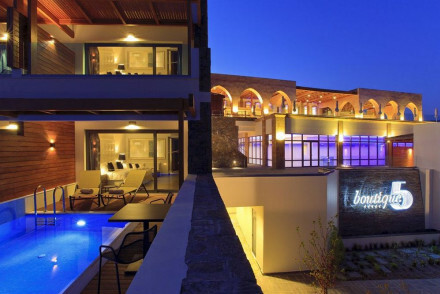 Boutique 5 Hotel & Spa is a really swanky Five Star hotel & spa resort on the beach front. Contemporary rooms and suites offer all the mod cons, private balconies, some even have private pools. Top of the range spa, Mediterranean restaurant, beach front terraces, and private beach. Lindos Blu is a superbly chic and luxurious hotel on a cliff top with stunning views over turquoise waters and a short walk from Lindos. Designer rooms and suites with all the mod cons and private balconies. Two fantastic restaurants, top of the range spa, and a private beach below. Rhodes is a year-round destination however the tourist season lies between beginning of April until the end of November. During the winter some of the hotels and restaurants close. Browse through our list of all the best places to stay on Rhodes. Expand your search to our Guru's list of the best places to stay in the Dodecanese. A quaint pension in the centre of the Old Town, close to all the action. Simple and comfortable white washed rooms. Restaurants and bars within easy walking distance. An inexpensive base to explore the city from. Sights nearby - In the heart of Rhodes Old Town the oldest inhabited medieval town in Europe. Great walks - Walk along the city walls for excellent views of this ancient city. 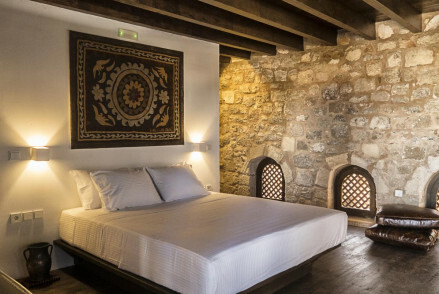 Lovely traditional guesthouse located in the heat of the medieval town. Charming rooms, some with great views of the old town or prettily draped four poster beds. Good value and a quiet alternative to the boutiques. Value chic - A lovely traditional property with quirky features and charming courtyard breakfasts all for a very reasonable rate. Sights nearby - Having admired them from a distance at the property visit the Citadel and the Palace of the Grand Master up close. Views - Situated near the summit of the citadel, views over the port & fascinating medieval town. Great walks - Just above the airport is the 'Valley of Butterflies' which makes for stunning walks. 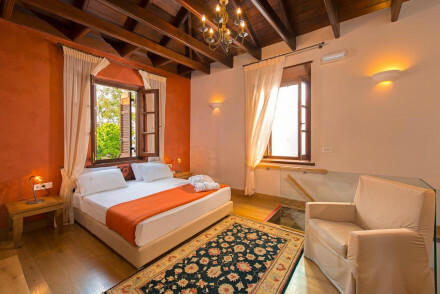 A traditional hotel in Rhodes Town centre, set in an 800 year old building. Simple and homely accommodation with basic rooms and a roof terrace overlooking the city and the bay. Perfect to keep costs low while exploring the lovely Old City. Local exploring - Ideally located for getting around the Old Town of Rhodes, two minutes from the centre and five from the harbour. Sights nearby - Visit the historic centre of Rhodes Town with the Street of Knights, Clock Tower and Grand Master's Palace. Sailing - A great stopping point for a sailing trip around the Greek islands. Great walks - Visit the stunning Kalithea Springs, less than five miles away. Harem-style high-camp glamour in this boutique hideaway in the old town. 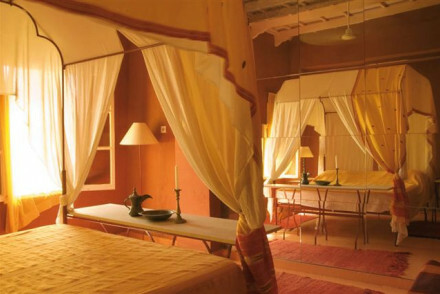 Vibrant brightly painted rooms with prettily draped four poster beds and Indian wall hangings. Terraces offer lovely city views. Full of character and well positioned for city exploring. City Style - The boudoir type suites have the feel of a pasha's harem, with deep colours, rich fabrics, beamed celilings and jacuzzis. Sights nearby - Walking distance from both the Collachium and the Palace of the Grand Master of the Knights of Rhodes. Great walks - Head out and explore this incredible ancient city on foot. A lovely collection of studio suites and apartments in Lindos. 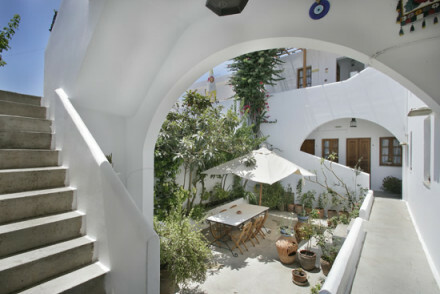 Traditional exterior with leafy courtyard, simple rooms with white washed walls, and kitchens for personal use. Melenos restaurant is fantastic. A great choice for couples looking for privacy, families, or those on a budget. Sights nearby - The Acropolis and the wonderful Temple of Athena. Views - Good views from the top balcony. Koukos Traditional Guesthouse, Rhodes, Greece A good value guesthouse combining Greek-rustic style, with quirky Alpine deco and excellent home-cooked food. Stay here for a fun holiday within easy walking distance of sandy beaches and Rhodes’ old town. Sights nearby - Mandraki port, Clock Tower and Archeological museum are a great insight to the history of Rhodes. Restrictions on children - No children can be accomodated at this hotel. Live like an Ottoman pasha in this stylish townhouse in the heart of the old town. An elegant homely feel. Large, high ceilinged rooms with prettily draped four poster beds. A spoiling breakfast is on offer. Friendly staff. A lovely place to explore the city from. Value chic - An atmospheric mansion, with indivdually decorated Eastern style rooms filled with antiques and Orientel rugs. Great walks - For stunning views of the Old Town walk along the medieval walls. Sights nearby - Visit the Knight's Castles the best being Kastéllo Kritinías. A brilliant little hotel, right in the heart of Old Town Rhodes. Modern minimalist decor throughout, white on white with soft neutral tones and a heavy use of wood, glass, metal and stone. The suites offer every comfort and the staff are helpful and friendly. Quiet but close to all the action. 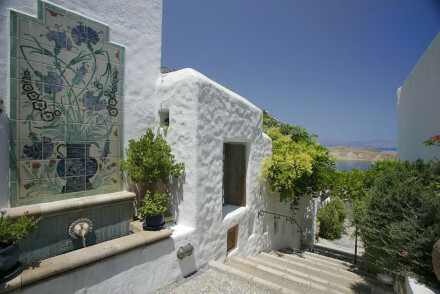 A relaxed and elegant boutique in the picturesque town of Lindos, Rhodes. The simple chic rooms offer white on white decor, comfortable beds, original artworks, and splashes of local craft design. The on-site breakfast is flavoursome and delicious and you are a short walk from Lindos' best eateries. Chic contemporary hotel surrounded by greenery, yet near the city centre. Large, light rooms with calming muted tones and great views. Enjoy the Mediterranean restaurant, trendy rooftop bar and spoiling spa. A relaxing hideaway yet within close proximity to the city's sights. Romantic Break - A trendy contemporary couples retreat in the new city with suites offering views of the sea, private jacuzzis and fine dining. Spa breaks - Indulge yourself in the glorious spa with pampering treatments including hot stone massages and after-sun body wraps. Great walks - Walk the stunning streets of the Medieval City pronounced a UNESCO World Heritage Site. Sights nearby - Endless options nearby from castles to ancient ruins or ornate churches. A slightly old-fashioned but charming hotel in central Rhodes. Just three rooms with four poster beds, a lovely courtyard terrace, and delicious breakfasts. Great value, romantic, walking distance to the beach. A wonderfully restored 19th century listed Rhodes mansion, on a quiet pedestrian street in the centre of the town. The multi-room suites offer designer Italian furnishings, high beam ceilings, private terraces and large bathrooms. An excellent breakfast is served in the charming central courtyard. A chic boutique with lots of character. 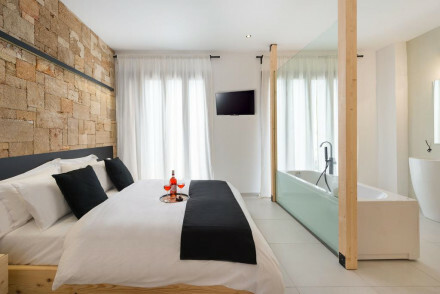 Individually decorated rooms and suites, some sleep up to 5, have creamy furnishings and attractive works of photography. Stunning views from a charming terrace. Great for families or couples. Families - 4 rooms sleep up to 5 people. 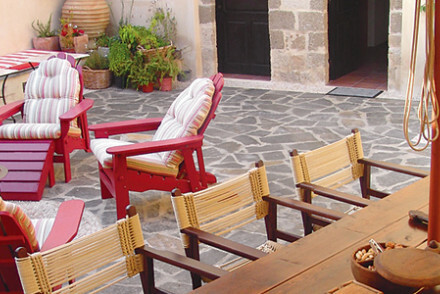 A gorgeous boutique hotel with all its original elements in the old town of Rhodes. Romantic rooms in traditional elegance, terraces, roof top jacuzzi, private yoga or massage. The perfect spot for a romantic beach holiday. Great walks - Walking tours available. A contemporary Five Star hotel on the beach with a fantastic spa. Rooms and suites, all with private sea-facing balconies, have pastel furnishings and a beachy ambience. Tropical gardens, lagoon-style swimming pool, multiple restaurants. You really needn't leave your hotel! Beach Life - Blue flag beach of Kallithea. Views - Most of the rooms have sea views. A spectacular boutique in the craggy hills of Rhodes. Chic interiors are a mix of traditional crafts, elegant local furnishings, driftwood features and luxury touches. With a central pool area and hot tub, rejuvenating open-air spa, wonderful botanical gardens and two farm to fork restaurants. Honeymoons - A chic and romantic hotel in a spectacular setting- add to this an open air spa, private pools, exceptional food, and no kids! Hotel Entertainment - Lounging by the pool, soaking in the hot tub or being pampered in the spa all sound pretty good! A really swanky Five Star hotel & spa resort on the beach front. Contemporary rooms and suites offer all the mod cons, private balconies, some even have private pools. Top of the range spa, Mediterranean restaurant, beach front terraces, and private beach. Looking to be pampered? This is the place! Beach Life - Kiotari is a blue flag beach. 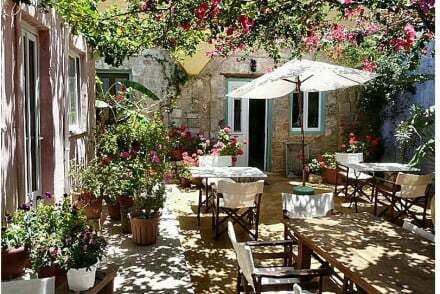 A charming boutique hotel in the heart of Rhodes Old Town. Set within a heritage building, the modern suites offer comfortable beds with rich linens; the best boast a private terrace and jacuzzi. Enjoy breakfast in your room or order a breakfast box to go if you're headed out early. A historic stay. 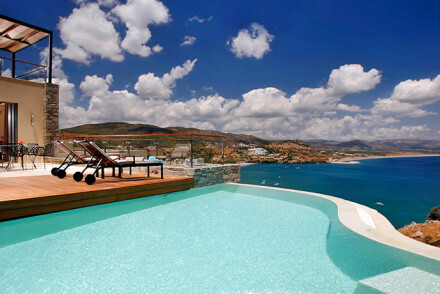 A classy and luxurious boutique refuge with spectacular views over the Aegean. 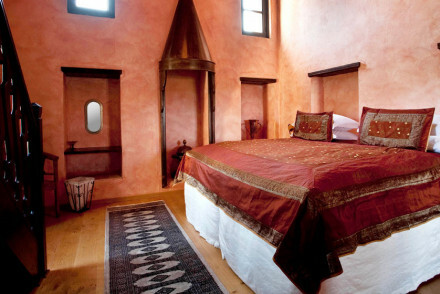 Large rooms decorated in a Moorish style with enormous raised beds and lovely sea views. A romantic rooftop restaurant is one of the best on the island. Just minutes from the beach. A lovely romantic escape. Romantic Break - An enchanting and intimate escape, the lovely rooftop restaurant is perfect for a romantic dinner under the stars. Hideaway - A charming hilltop property away from the hussle and bussle with views sweeping over the city. Great walks - Hike up to the 10th-century Acropolis above the hotel, you'll be rewarded with fantastic views. Sailing - Spend a day exploring the island from the sea, the ideal romantic day trip. 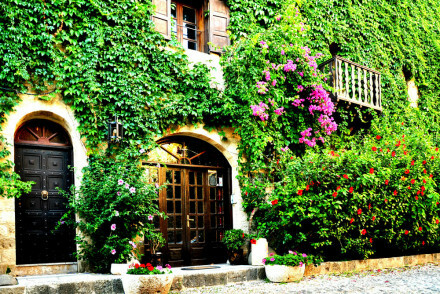 A delightful family-run hotel in a charming 14th century building. Individually decorated rooms are awash with heritage and emblems of the rich history of Rhodes. In the evening, enjoy delicious Greek dishes from the traditional stone oven. Conveniently located in the heart of the cobbled old town. Local exploring - An ideal base for soaking up the history and culture of Rhodes, situated on a quiet cobbled street in the medieval Old Town. Romantic Break - Transport yourselves to another time, with traditional suites and rooms overlooking the arches, ramparts and moats. 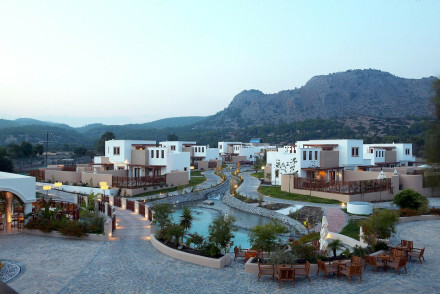 Sights nearby - Visit the ancient Acropolis of Ialyssos, five miles from the hotel. A world Heritage site. Local markets - Check out the local markets of Rhodes where you can pick up some amazing deals. 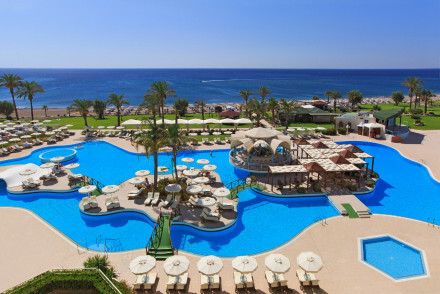 This five-star luxury resort is nestled on the seafront in Rhodes. Guests can choose between rooms and suites in a bohemian or Ottoman style; Ottoman suites are located along a tree-lined boulevard and come with a private pool or jacuzzi. Be sure to book in to the spa at this indulgent Greek hotel. A superbly chic and luxurious hotel on a cliff top with stunning views over turquoise waters and a short walk from Lindos. Designer rooms and suites with all the mod cons and private balconies. Two fantastic restaurants, top of the range spa, and a private beach below. Romantic beach life in luxury. Beach Life - Direct access to it's own private beach. 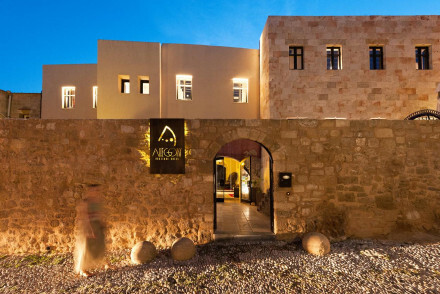 This boutique hotel occupies a heritage building in Rhodes' old town. The individually styled suites have a rustic feel, with exposed stone walls and hand-selected antique furnishings; the best have terrace doors that open onto the hotel courtyard. Enjoy al fresco mezé dining at this historic hotel. 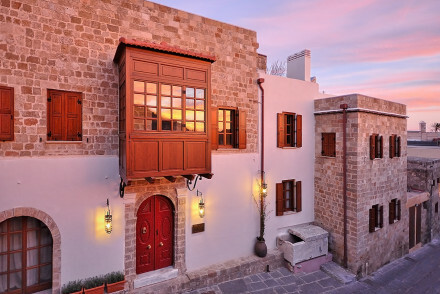 A historic boutique hotel in the heart of Rhodes Old Town. Rooms have simple interior design, allowing the building's original features to shine through. There are exposed stone walls throughout and the best suites have a freestanding tub. Enjoy breakfast in the pretty courtyard; an elegant hotel.